WhatsApp is the most popular Instant Messaging application in the world, that’s why it is available for all platforms like IOS, android, windows, blackberry and even for Nokia S60, Samsung Tizen etc.in today’s time WhatsApp is available for all type of phones whatever it is branded or none branded. Well, in this article I am going to share you some tricks on how to hack WhatsApp account. I know many ladies search for how to catch a cheating husband on WhatsApp and many men’s searches for how to hack wife’s WhatsApp account. Lol, it might look funny but it is 100% true. WhatsApp is must for all mobile phone users because it is fast and easy to operate for any phone user. but everybody has a question that is “how to hack WhatsApp account, As WhatsApp is growing nonstop day by day, so many Peoples wants to track down their partner’s/spouse’s WhatsApp account and now it is possible! So today we are going to tell you how to hack WhatsApp Account. I will provide you the two working methods for WhatsApp Hack, you need to follow the steps properly to succeed in using these methods. Below are the two most popular methods for WhatsApp hack, let’s have a look. Just follow the simple steps given below to hack WhatsApp using MAC Spoofing. This is the best working method but you need a little effort as well for implementing this method. 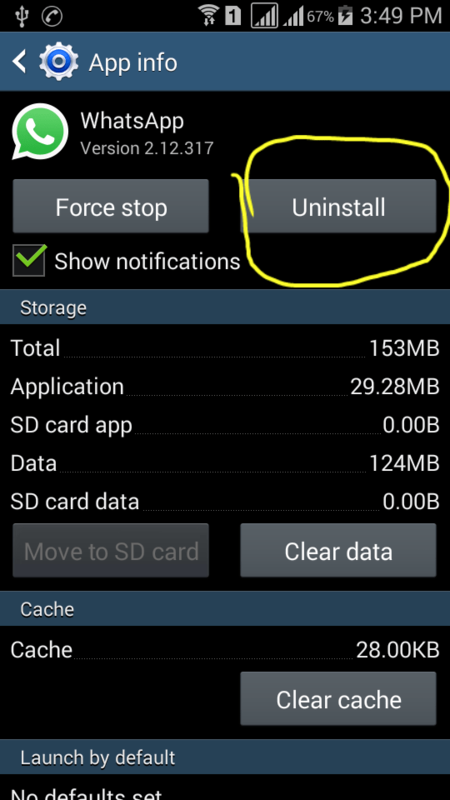 If you have installed WhatsApp on your phone then first of all “Uninstall WhatsApp from your phone” you will need to install it again at the end of this method but you will have to configure it differently. Have your Partners phone, you will need your partner’s or target’s phone two times during the whole process. When you have a phone in your hands’ search for settings icon in the phone menu. 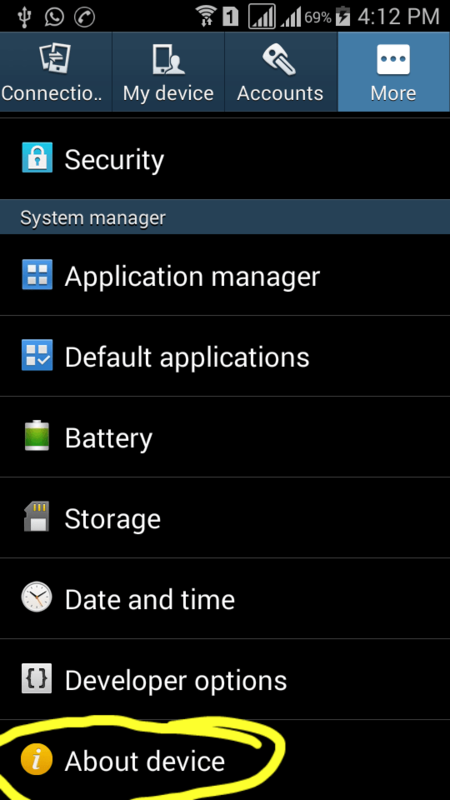 Now find About device option in settings (see screenshot below). 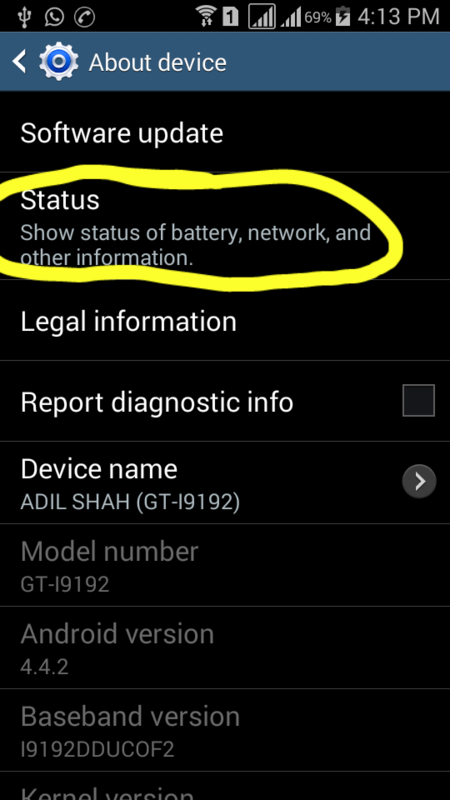 Now find Status option (according to Samsung Android 4.4). And now you will see WiFi MAC (media access control) address here. Write down this address somewhere because you will need to change your phone’s MAC Address to this address, it is written in six pairs and separated by colons (23:gh:95:kh:os:75). 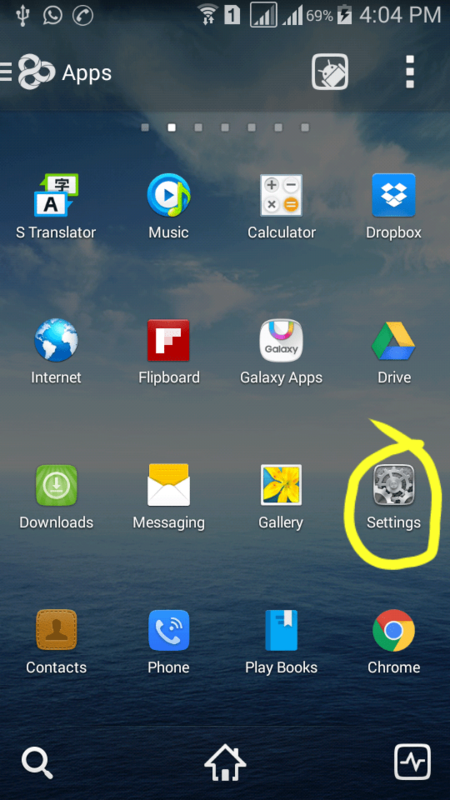 Above settings are for Samsung android if you are looking for another operating system so you can do it as follows. * iPhone – click on settings—>general—>about—>WiFi address. * Windows – click on settings—>about—>more info—>MAC Address. * Blackberry – click on options—>Device—>Device and status info—>WLAN MAC. 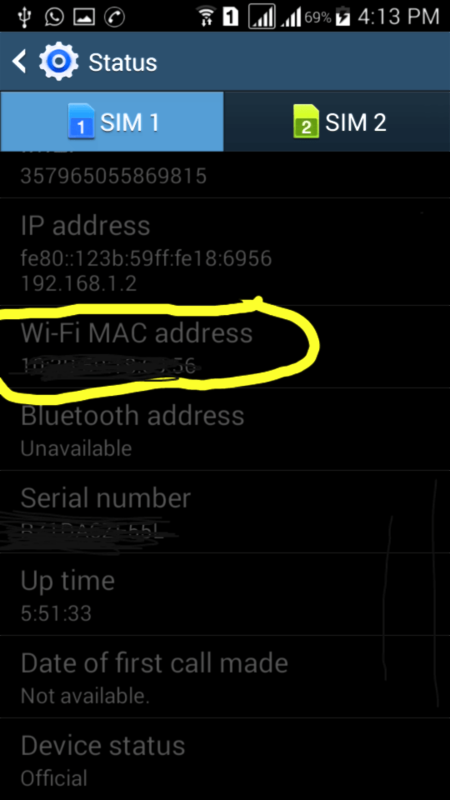 Now find your Phone’s MAC Address using the instruction written above. (write down your MAC Address at safe place as you will need to change your device back to this address). 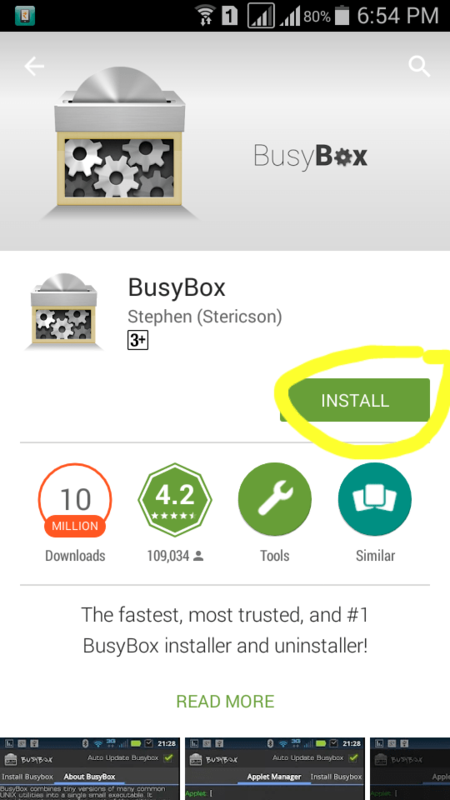 Now with the help of busy box in Android, you can change your phone’s MAC address to your target’s MAC number. * On iPhone you can use WiFi Spoof or MAC Daddy X to change your MAC address. After changing your phone’s MAC Address, install Whatsapp again on your Phone and enter your target’s Phone number to set up WhatsApp on your phone. Now you will need your Target’s phone to see confirmation code which has been sent by WhatsApp to him/her number. Enter this confirmation code in your phone’s Whatsapp and you are ready to go (delete that confirmation message from your target’s phone if you don’t want to get them know about it). Now you are able to see their Messages on your WhatsApp. You can change your MAC address back to your own when you no longer need to read their messages. ( see instructions above to change back your phone’s MAC address). This is the second method for WhatsApp Hack, this method is very easy to use but you need to follow all the steps properly. So just go ahead and follow the steps that are given below to hack WhatsApp using Spy software. First of all, you will need to use your target’s phone (your target may be your partner, your children, your employees etc). It is better you ask them before you use their phone. Now go to google play and buy Spy application, there are many applications available on google play like WhatsApp spy, Mspy etc. After purchasing the application on your target’s phone. Follow the on-screen instructions to spy your target’s WhatsApp. Setup the application carefully so you can easily receive messages and other information from your target’s WhatsApp account. And now you are all done to hack or track your target’s WhatsApp account. So in this article, we have explained full trick on How to hack WhatsApp account, the trick we have told you is only for experiment and knowledge purpose. I have told you two advanced tricks for hacking Whatsapp accounts. So now if you are a lady then you don’t need to search more about how to catch a cheating husband on WhatsApp because I have told you the perfect solution to this issue. We want to give you an advice, that you do not use it in any wrong way otherwise you may be stuck in bad circumstances. So enjoy this cool trick and stay connected with us for more awesome and innovative tricks. Any query? Please tell us in the comment box. HI is thare anyway to find out who is chating with whom at a particular time in Watsaap .